A new 1,254sqm Aldi foodstore with 78-space car park designed by our Milton Keynes office has been officially opened in Herne Bay, Kent, by Olympic gold medal-winning rower Tom Ransley MBE. 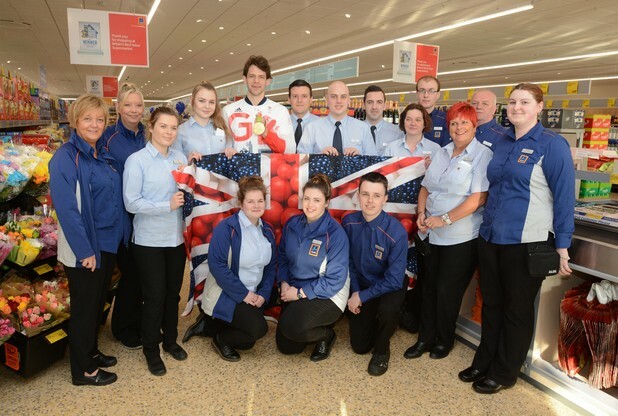 The Kent-born Team GB athlete cut through a red ribbon with the Olympic paddle he used at the 2016 Rio Olympics before meeting and greeting customers and signing autographs. Eagerly awaited by shoppers, the new Kings Road store has created 30 new local jobs and is expected to draw in an extra 500,000 visitors and shoppers to the town centre each year.